Warm and welcoming, this lovely apartment in an antique village house offers the right amount of privacy to those wishing to spend a few days away from it all. At the entrance of an ancient village and boasting a kitchen with fireplace. Car parking 50 metres from the house. You will sit in front of the little house overlooking the hills, with the sweet sound of the bells of the mountaingoats clinging in the background. A Barbeque for common use with a lovely spot where to have your dinners "al fresco". You can have a swim at the beach of the river Lima at 3 km from the house, and this river has a lot more to offer; rafting, rock-climbing, there is an adventure park named "Canyon Park" nearby. And when you feel like some sightseeing or shopping, Lucca is a most beautiful and lively Tuscan city of art and great shopping, restaurants, museums etc etc Have fun and happy holidays! You will be welcomed with a small basket of local products! Nearby is the Canyon Park, the first Adventure Park in Italy inside a Canyon! 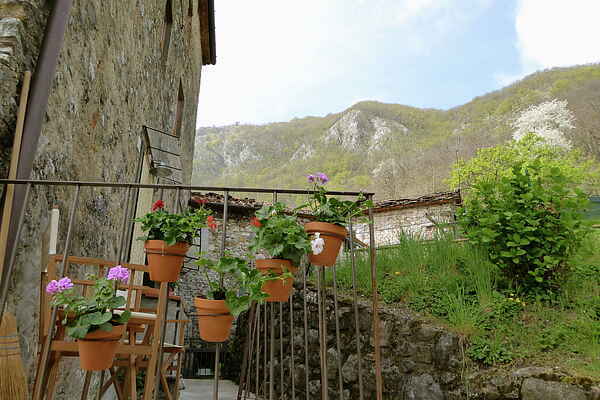 The park is located in the Narrow Gorge Cocciglia, in Bagni di Lucca. Protected by a vegetated roof it hides a magical stretch of river with sheer walls. A place still intact where water, rocks and forest have created harmony that only nature can draw.